On April 5th, the College of St. Scholastica hosted a choir concert entitled “Still I Rise: Songs and Stories of Struggle and Strength” with proceeds benefiting Safe Haven Shelter and Resource Center. 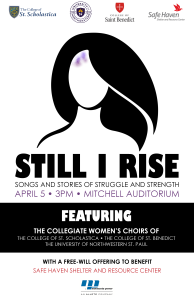 The concert, which featured three collegiate women’s choirs from the College of St. Scholastica, the College of St. Benedict and the University of Northwestern—St. Paul, included songs of hope and empowerment, as well as a personal story of survival from one of the women we’ve served. Leading up to the event, Safe Haven’s Community Education Coordinator had the chance to speak to each of the three choirs about healthy and unhealthy relationships. The presentations touched on red flags of abuse, the importance of establishing personal boundaries and how to seek and refer others to help in their communities. We’d like to thank Minnesota Power for sponsoring this event, Bret Amundson at the College of St. Scholastica for approaching us with this opportunity and all of the attendees and donors that showed up to support us. It takes an entire community to combat domestic violence, and we could not provide the services that we do without your vital support.